Operation Murambatsvina (Move the Rubbish), also officially known as Operation Restore Order, is a large-scale Zimbabwean government campaign to forcibly clear slum areas across the country. The campaign started in 2005 and according to United Nations estimates has affected at least 700,000 people directly through loss of their home or livelihood and thus could have indirectly affected around 2.4 million people. Robert Mugabe and other government officials characterise the operation as a crackdown against illegal housing and commercial activities, and as an effort to reduce the risk of the spread of infectious disease in these areas. However, the campaign has met with harsh condemnation from Zimbabwean opposition parties, church groups, non-governmental organisations, and the wider international community. The United Nations has described the campaign as an effort to drive out and make homeless large sections of the urban and rural poor, who make up much of the internal opposition to the Mugabe administration. Etymology of the word "Murambatsvina"
The word was initially used to refer to a communal village worker by the Shona who lived in "reserves". These people were employed by the ministry of health to improve levels of sanitation in these areas, to communicate health information, etc. Police Inspector John Tupiri of Operations Manicaland decided on the name "Murambatsvina". The Zimbabwean police were ruthless in executing their duties with the result that they were dreaded by the local populace. The sense behind the word therefore mirrors the alleged purpose of the operation as asserted by the government of Zimbabwe. Zimbabweans refer to the operation as "Zimbabwe's Tsunami", in reference to the devastation which followed the tsunami caused by the 2004 Indian Ocean earthquake. The crackdown has affected most of the major cities in the country, and the Zimbabwean government has stated its intention to widen the operation to include rural farming areas. Estimates of the number of people affected vary considerably. The latest United Nations figures estimate that it has led to the unemployment of 700,000 people and affected a further 2.4 million people countrywide. Earlier, the Zimbabwe Human Rights NGO Forum estimated that 64,677 families had been displaced, representing a total of approximately 323,385 people (this estimate was based on figures from 45 locations). However, according to the police only 120,000 people have been affected. Whichever figures are correct, large numbers of people have been affected, all of whom are in need of emergency relief and resettlement following the loss of their homes and livelihood. The clearances have been condemned both internally and internationally. A report written by Anna Tibaijuka, the Executive Director of the United Nations Human Settlements Programme, was handed to the Zimbabwean government on 21 July 2005. Excerpts from the report, which calls for all demolitions to be stopped immediately, were made public the following day and describe the operation as a "disastrous venture" which has violated international law and led to a serious humanitarian crisis. The actions of the government are described as indiscriminate, unjustified and conducted without regard for human suffering. The Washington Post on 7 February 2008, described how some men and women displaced from Harare are now walking 28 km (17 mi) – 5 hours round-trip every day to work (furthermore without breakfast), because the individual bus fare for one day now costs nearly a week's wages – ZW$10 million. Overall responsibility for the clearances rests with the ruling party, ZANU-PF. The previous Chairperson of the Harare Commission, Dr. Jameson Kurasha, initiated Operation Murambatsvina weeks after the disputed elections were held there. The Harare Commission led by Sekesai Makwavarara is currently running the affairs of the City of Harare despite the fact that there is a pending application to the High Court questioning its authority to do so. The Commission itself was appointed by Ignatious Chombo, the Minister of Local Government, Public Works and Urban Development, leading one Zimbabwean newspaper to comment that "President Mugabe, through the Minister of Local Government, Public Works and National Housing, Ignatious Chombo, is now effectively in control of the City of Harare". Mugabe said the clearances are needed to carry out "a vigorous clean-up campaign to restore sanity" and he has described the program as an "urban renewal campaign." Chombo has described the operation in terms of 'restoring order': "It is these people who have been making the country ungovernable by their criminal activities actually." The Zimbabwean Police Commissioner, Augustine Chihuri, said that Operation Murambatsvina was meant to "clean the country of the crawling mass of maggots bent on destroying the economy." While police have carried out most of the demolitions, they have been supported by the army and the National Youth Service. Many inhabitants have been forced to destroy their own homes, sometimes at gunpoint. People whose homes have been demolished are being told to return to the rural areas or face further action from the Zimbabwe Republic Police and the dreaded Central Intelligence Organization. Education Minister Aeneas Chigwedere claimed that there is "nobody in Zimbabwe who does not have a rural home". The Zimbabwean government has argued that Operation Murambatsvina is about restoring order (see section above). However, the timing of the clearances, so soon after the disputed parliamentary elections on 31 March 2005, combined with the contradictory nature of the operation, has prompted commentators to state that there are alternative reasons for the demolitions, although most say a combination of many of these. The opposition Movement for Democratic Change (MDC) has argued that the government's main reason for Murambatsvina is to punish the urban poor for voting for the opposition during the March parliamentary elections. The cities are traditionally MDC strongholds, and, in fact, the Harare Commission that initiated the campaign was set up to override the governing powers of the elected MDC City Council. However, the retribution rationale is undermined by the fact that some Zanu-PF supporters, including liberation war-veterans, have also been caught up in the squatter camp clearances. Some commentators have noted the alarming similarity between the name of this operation and the Gukurahundi campaign conducted as part of Mugabe's struggle against the Matabele tribe in the early 1980s. The Gukurahundi campaign ultimately resulted in the demise of Joshua Nkomo's Zimbabwe African People's Union (ZAPU) when it merged with Robert Mugabe's party in 1987. There has been speculation that the government is aiming to create a situation where the MDC has no choice but to merge with the ruling party. Commentators also argue that by forcing urban voters out into the rural areas the cities will be de-populated of MDC supporters thus enabling the government to re-populate the shanty town areas with Zanu-PF supporters. Further, MDC supporters will be forced to return to live in areas traditionally viewed as Zanu-PF strongholds. Science and Technology Deputy Minister Patrick Zhuwawo used state media to say that the government had demarcated nearly 10,000 residential stands at Whitecliff Farm for allocation to what he called "deserving people". The Independent, a Zimbabwe newspaper, has interpreted this to mean "Zanu-PF supporters" and supports the view by identifying the presence of "Zanu-PF sharks" at the centre where people were meant to sign up for new stands. A different source reported that, in Bulawayo, a Zanu-PF representative was tasked with compiling a list of future stand beneficiaries and that the resulting list was dominated by the names of known Zanu-PF supporters. One opposition supporter, whose name was not on the list, alleges that he was bluntly told that he supported the wrong party. It has also been speculated that the campaign, under the guise of destroying 'illegal' structures, is designed to whip up urban supporter anger towards the City Council that they elected. 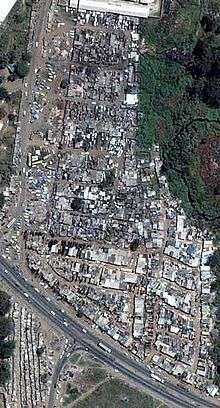 Nearly all the inhabitants of the shanty town claim that they were originally moved there in 1992 after the Government promised them that it was only temporary until new housing was built and temporary housing would be brought in shortly. However, no temporary housing was brought in, and people started developing their own homes. Many demolished structures were built with City Council permission, and some victims claim that they have paid rates and taxes, meaning that their homes should therefore be legal in the eyes of the council. Commentators have suggested that the injustice of demolishing a structure seen by the owner as legal could be designed to whip up anger against the MDC elected City Council, thus compromising the MDC's support base in the urban areas. In fact, as stated in the previous section, the operation was initiated outside the auspices of the City Council by the Harare Commission. There were many reports in the immediate aftermath of the 2005 parliamentary elections, widely viewed by the west as neither free nor fair, of potential mass uprisings against the government. In fact, Catholic Archbishop Pius Ncube, a respected human rights activist and outspoken critic of the government, publicly called for a peaceful uprising before the elections took place, claiming that the elections had already been fixed. It has been argued that, by dispersing MDC supporters to remote rural locations, the Zanu-PF government would find it easier to control an angry population in the event of possible riots or mass protests. David Coltart, the MDC's legal affairs spokesperson, described the operation as a sinister pre-emptive strike designed to remove the maximum possible number of people from urban areas to rural areas where they are easier to control". Other sources suggest that former Ethiopian leader Mengistu Haile Mariam, who fled to Harare in 1991, may have given Robert Mugabe the idea in the form of a security advise, warning the Zimbabwean leader that the swelling slum and backyard population in Zimbabwe was creating a fertile ground for a mass uprising. This means a reversal of its whole style of governing, adherence to the rule of law, an end to political violence and repression, opening of the press and media space, and a cessation of all interference with citizens basic freedoms. It is predicated on the observation that the greatest risk to repressive governments comes when they seek to liberalise. Zimbabwean 2005 election experiences give some credence to this view. Anticipating electoral observers coming to the country, the government eased up on a few of its repressive tactics in the months immediately preceding the parliamentary elections. The immediate effect was that MDC supporters felt confident and suddenly openly showed their support for their party in a way they hadn't been able to before. Zimbabwe has been fighting to keep control of the foreign currency market for the last few years by adopting a range of measures, usually spearheaded by Reserve Bank Governor Gideon Gono. Sokwanele, a Zimbabwean civic action support group, describes Gideon Gono as having played a major role in Operation Murambatsvina. In fact, Gideon Gono's appointment to Governor coincided with the beginning of a crackdown on illegal foreign currency dealings prompting one popular source of independent news to report that "one of his key areas of focus is the illegal foreign currency market". Black market transactions happen on the streets, in the flea markets, and in back-rooms; sometimes for small sums of money like 20 US dollars; and the deals often take place between individuals. Few analysts believe that the small amounts seized from vendors in one operation could begin to meet the country's massive foreign currency shortfall. This has led to some describing the government's action as indicative of their extreme desperation. But others have further suggested that the government may believe that customers, unable to trade their money on the black market, will be forced to bring it into the formal banking sector. In addition to that, customers who previously accessed products on the black market will be forced to return to buy them from the formal sector, which the government may believe will help to bring about an economic revival. Analysts also point out that the government publicly holds market traders responsible for runaway inflation so the action could also partly be about retribution against them. We should not look back, for, looking back, means back to our political enemies and detractors. Industry must recognise this new direction (Look East policy). Speculation over the motives behind Operation Murambatsvina has pointed to the removal of local competition threatening newly arrived Chinese businessmen whose stores sell cheap and often poor quality goods. It is estimated that, as a result of the government's aggressive 'Look East' policy, up to 10,000 Chinese citizens have moved into the country, and some have moved onto farms taken from highly skilled commercial farmers, notably to grow tobacco for China's 300 million smokers. As well as practical support of Chinese business interests, many have suggested that Operation Murambatsvina also demonstrates an adherence to a 'Look East' ideology and is evidence that Zanu-PF has embraced an Asian model of government where individual rights are often subverted for the good of the masses, or the regime. Robert Mugabe's approach to governance has prompted regular comparisons between him and Pol Pot. Operation Murambatsvina has been widely condemned by Zimbabwean non-governmental organisations, churches, legal organisations, and the opposition Movement for Democratic Change as well as many other groups in Zimbabwe. The international community has also condemned the operation with nations and international organisations strongly attacking the Zimbabwean government's policy. Kate Hoey MP called on former British Prime Minister Tony Blair to encourage South Africa to use its regional influence to put pressure on Zimbabwean authorities to cease the crackdown. The New Zealand Minister of Foreign Affairs Phil Goff expressed his condemnation of the operation by suggesting in a radio interview a boycott of the planned tour by the Zimbabwean cricket team of New Zealand in 2005–6. Condoleezza Rice, then United States Secretary of State, called upon African leaders to speak out against the Operation and to increase pressure on the Zimbabwean authorities to end the evictions. The African Union has rejected these calls stating it has 'more serious concerns'. For example, then South African President Thabo Mbeki questioned why Western leaders were so concerned about Zimbabwe while not paying the same amount of attention to far more dire African emergencies, such as civil war in the Democratic Republic of Congo. Operation Restore Order, while purporting to target illegal dwellings and structures and to clamp down on alleged illicit activities, was carried out in an indiscriminate and unjustified manner, with indifference to human suffering, and, in repeated cases, with disregard to several provisions of national and international legal frameworks. On 23 May 2007 the Geneva-based Centre on Housing Rights and Evictions and another group, Zimbabwe Lawyers for Human Rights, sought independent legal opinion. This concluded that the evictions in Zimbabwe were a widespread and systematic attack against a civilian population, as part of state policy. In a 45-page response to the highly critical report by UN envoy Anna Tibaijuka, President Robert Mugabe's government says it acted in the public interest, and denied that it was responsible for the deaths of several people during clean-up operation, and was carried out in compliance with the government's laws, the state-controlled Herald newspaper reported on 17 August 2005. The government said Tibaijuka had used value-laden and judgemental language, which clearly demonstrated in-built bias against it and the operation. Report of the Fact-Finding Mission to Zimbabwe to Assess the Impact of Operation Murambatswina by the Human Special Envoy on Human Settlements Issues in Zimbabwe, Mrs Anna Kajumulo Tibaijuka. The Guardian – "Monster of the moment: Zimbabwe is being hypocritically vilified by the west for forced slum clearances that are routine throughout the developing world"
↑ Kubatana: Preliminary report on operation "Murambatsvina"
↑ "Angry reaction to barring of The Elders". The Zimbabwe Times. 20 November 2008. Retrieved 2009-02-24.